For a while now, I've been looking at this old Chevy sitting up on blocks at a garage in Walnut Cove. Every time I pass by, I check it out to try and find a workable composition for it. Every time, I talk myself out of the picture because of the surrounding clutter. There are other cars parked very close to the side of it, there is a house behind it, and a street to the other side. There is a nice tree behind it, but it was well past peek when I first saw the car, so the burnt color on the leaves really didn't work out for the image. Everything that I could think of for this car left me feeling like it would just be "another picture," which is something that I really do try to avoid. 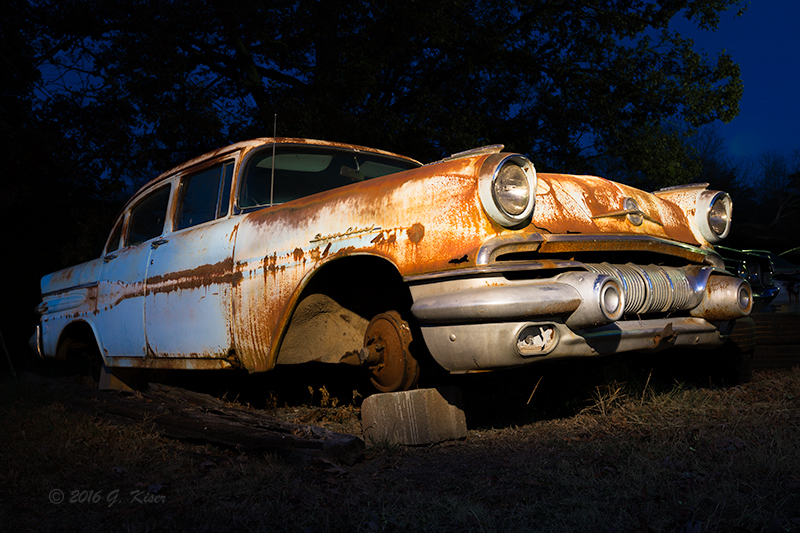 In the last week or so, I decided that I could capture this car at night and do some light painting on it which has worked out well for me in the past with subjects in a cluttered environment. My concept was to get down low and shoot from below bumper level, up to the sky, concentrating on the front clip of the car. For this, I was looking at having some clouds moving in the sky so that I could have some nice motion rendered over the course of the long exposure with the light painting. It was an interesting concept, but one that would need specific elements in place. For the last three days, I've been watching the conditions and trying to figure out when the best time would be to make this picture happen. The short answer was...just not going to happen the way I want it to. Knowing that the cars at this garage tend to move around from time to time, and get gone, I didn't want to wait too long for conditions to be right. I came up with another plan of action that would incorporate the tree behind the car as a bit of background interest, while still shooting low. The sky would not be that important, and I could get away with a clear sky for this concept. With that idea, I decided to set out on my last day off before going back to work. I arrived just after sunset which was the perfect time to get set up. I still had a good deal of usable light so that I could see to get the camera set up, and the focus locked before that became cumbersome due to low light. I started out with my 24-70mm lens and quickly realized that this didn't give me enough of a wide angle for the composition I was having to put together. So, I swapped out to my 16-35mm which gave me a lot more flexibility where I needed it. I also moved away from the car, and raised the camera just a little bit. I got my flashlight ready, and just waited for the sun to drop. As things were starting to happen with the lighting, I started doing some test shots to see how the car would look under the warm tones of the flashlight. I worked out how I needed to "paint" the car in just a few exposures, and found that I could do it in about six seconds which was more than quick enough. While I was dialing things in, I noticed a Stokes County Deputy pulling in and watching from a distance. I was figuring he was running the tag on the car, and watching to see what I was doing. I gave a friendly wave and went back to what I was doing. I just knew that at any minute I was going to get approached and asked what I was doing, but that moment was starting to look less and less likely. I kept on adjusting the exposure, and getting shots as the light went down so I had plenty of options when it was time to pick the image I wanted. At one point, he came over the PA and asked if I would like him to light the car with his take down lights. That told me he was comfortable with what I was doing, and was just watching at this point, so declined the offer, knowing that for my purposes, the Maglite was more than enough light, and was the right color temperature. I kept on for a few more minutes, and then I could hear that he was approaching on foot. We made introductions, and I found out that he was also an aspiring photographer which, of course, gave us something to talk about for a bit. Once I let him know that I was a police officer as well, his stress level went way down, and we chatted for several minutes. As the light dropped, he bit me a good evening, and I got back to business with the car. As it turned out, we parted company right as the sky was where I wanted it. I was still getting the silhouette of the tree to the rear, but the focal point of the entire image was what I was painting with my flashlight. This was looking pretty good if I did say so myself. I was looking forward to getting home and seeing how things looked on the computer since the LCD on the camera is a terrible gauge of the exposure, and the histogram wasn't really registering a wonderful curve. As the sky finally went dark, I packed up, and made my way home. On the way, I did notice another potential car off to the side of the road on the other side of a fence. I was pretty sure that I could shoot the scene from the outside of the fence, but it will probably be one that I will attempt to make contact with the property owner at some point to get inside of the fence. Either way, I have a lead on another old car which is always nice this time of year. Happy Thanksgiving everyone! Since Toni had to work today, and I was off, I decided that I would go out for some pictures. I'm still wanting to do waterfalls, but there just isn't enough water in the state to really make that a possibility right now. Ironically though, the weather was calling for rain, and clouds through the morning with clearing skies after 11. 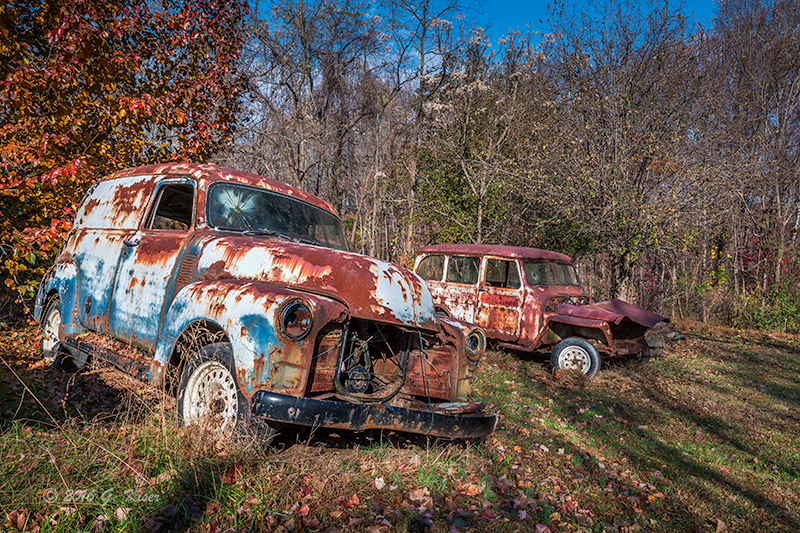 This was actually pretty good news for me, and I was looking forward to taking a little road trip up through Danbury, NC to work some of the old vehicles I had come across last weekend. 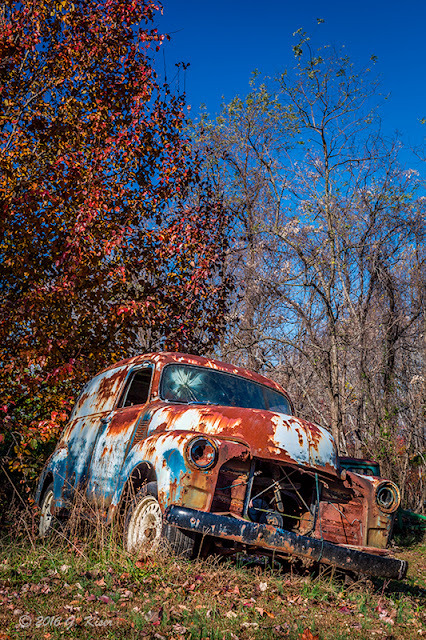 I also wanted to try a creative composition with a 57ish Chevy I've located that is in a particularly lousy setting to photograph. I set out before sunrise in an attempt to get the first light in the sky for a background, and to be able to light paint the actual car. There was a little bit of rain falling, but the hourly showed that I would be OK once I got where I was going. Well, the forecast was right, and the rain stopped when I got there. However, the sky was way too blah for the long exposure that I was wanting to do. I needed a much different sky for my idea to work. The good news was, with the right sky, I think the picture will come out quite nice in the end...if I can get what I want in the right combination before the car gets moved. Not wanting to admit failure before the sun even came up, I plowed on to the North headed to Danbury. When I got there, the lighting was really good with the clouds, and the recent rainfall on the ground. I even found a subject that I wanted to photograph with the existing light. I stopped the truck and started to consider my options as the rain started to drizzle. That wasn't going to be a concern though, as the angles would be such that the front element would be shielded by the hood. What bothered me was the two dogs that were coming down the street with a purpose towards my truck. They had that look in their eyes that indicated I was going to be their Thanksgiving Feast if I got out of my truck. Not wanting to be an early meal, I cut bait, and started to drive on down the road. Well, I had two ideas for the morning, and both of them have failed to materialize. Such is the luck of a photographer I suppose. Well, I was out, so I decided to throw caution to the wind and get lost. I don't mean a little lost...I mean crank the GPS up to get home lost. I went down roads that I've never heard of before, and entered townships I never knew existed. This was what Toni had suggested I do a week or so ago, and today was as good a day as any to do that. The the lighting was still really good as the clouds were thick and low in the sky. I just wasn't having much luck in finding that perfect subject to work with. There were plenty of barns and old houses, but none of them spoke to me this morning. There were issues with the compositions for every subject I found. To make matters worse, the clouds were starting to break up, and I could see that the sun was going to be poking through soon. This could be a very good situation with the right subject, but it also meant that the good light was going to be short lived from this point on. This was going to be magic light time if I could find the right subject. The sun was now clearly out in the open and the sky to the West was still covered in clouds with a nice texture. Out of the corner of my eye, I saw three different barns down a side road. I made a quick U-turn and went down the street. It looked more like a driveway than a street, but the sign indicated it was a public roadway. I pulled over to the side of the road and got the camera out. Wanting to work fast, and knowing that I wanted some depth to this one, I used my 24-70mm lens with a color intensifying polarizer. 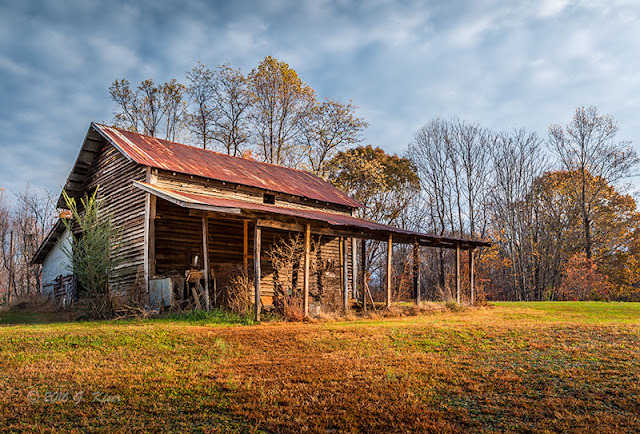 I worked from several locations to try and get the best composition from the three barns. The more I worked the scene, the more I realized that there was only one barn that I really liked out of the three, and it was the largest. There just wasn't much space between that one and the neighboring structure. I wanted the sky in a large portion of the frame, but I didn't want the barn to show too much perspective distortion, so I had to really balance how close I got to the barn, and what focal length I used. What I ended up with was using about 30mm worth of lens, fairly close in to the barn. Once I was happy with my composition, I had to sit there and wait for the sun to do it's thing. Slowly, it came out from behind the clouds and lit up the barn with a wonderful, warm light. I had already worked out everything except for the shutter speed, which I dialed into get the proper exposure on the barn. That actually ended up underexposing the sky, which for my tastes was a perfect combination! Within a minute, the clouds started to clear, but not after I got my shot. I had taken about a dozen or so frames from this location, and while I liked some of the ones that included the other two structures, they all seemed to fail in comparison to this one. The lighting was dead on, and the composition followed one of my new rules for myself--Fill the frame with what you want. There was a nice flow, and balance as well. I found no need to process the other shots, and I was satisfied with the results of this one for the location. Now the clouds were all but gone in the sky, and the sun was steadily climbing. Normally, this would mean that I was done for the day as the quality of light was lacking. However, I was coming off of what I thought was a pretty successful subject, and I wanted to use that as motivation to keep going. I continued North into Virginia on a road I probably could never find again. I was starting to come off of my photography high....OK, I actually had. I was squinting in the sun, and losing interest in the light. Then I passed a house with a red Ford Fairlane 500 in the yard. It was in decent shape, but I could tell it was not an operable vehicle. It caught my eye, and my imagination. It wasn't perfect, but it was the best option I had seen in a while. I turned around and went to knock on the door of the house. This is one of the most nerve racking parts of doing this type of photography. Normally, I'm met by the owner who has come out of the side of the house with a gun pointed at me. I'm not sure if this guy was armed or not, but he answered the door I knocked at (nice change of pace), and allowed me to explain the reason for my holiday visit. Surprisingly, he gave me full permission to go and play among his vehicles. I was now looking further into the property, and the vehicles no longer were just the Fairlane and a Bronco. There were several old rusted shells in the woods. Yep, I was glad I stopped here! I found three of them to be my favorites based on location, surroundings, and general condition. I started to set the camera up, again using my 24-70 with a intensifying polarizer attached. I started to work on the group of vehicles since they were so close together I didn't feel comfortable trying to separate them in the frame. The lighting was harsher than I like, but I was able to make due, and compose using the lit side to keep out of the shade as much as possible. One thing that I have learned over the years is that the position of the camera can make or break an image. That really holds true for these vehicles. By adjusting the angles of the camera, I was able to eliminate the middle vehicle and concentrate on these two that were very similar in appearance. I also benefited in this composition from the shadows cast by the sun coming through the trees to my back. These shadows created some very strong leading lines that I thought really strengthened the image. The primarily blue sky above, helped to bring out the remaining blue tones on the panel truck as well, which helped to balance the image with color tones. In an attempt to make sure I got every possible composition, I swapped out my lens for the 70-200mm. Now, I had some other compositional tricks I could use. By stepping back a little bit, I was able crop out the closer jeep, and increase the relative size of the green Jeep that was further away. The trick here was to cover the background clutter with solid parts of the panel truck, which I was able to do by paying very close attention to the height of my camera on the tripod. Before leaving, I decided to try and isolate what had become my favorite vehicle out of the bunch. I flipped the camera on its side and got down pretty low to the ground to reduce the impact of the green Jeep to the rear. It is still visible, but with the exposure difference, it is not distracting at all. As you can see, I had a great time at this property, and am very appreciative to the owners who allowed me to get a few photographs. I really do enjoy photographing these old cars, but I'm a little gun shy after several really negative experiences talking to property owners. I don't fault them for being cautious as i would be with strangers asking to get up close and personal with my property. 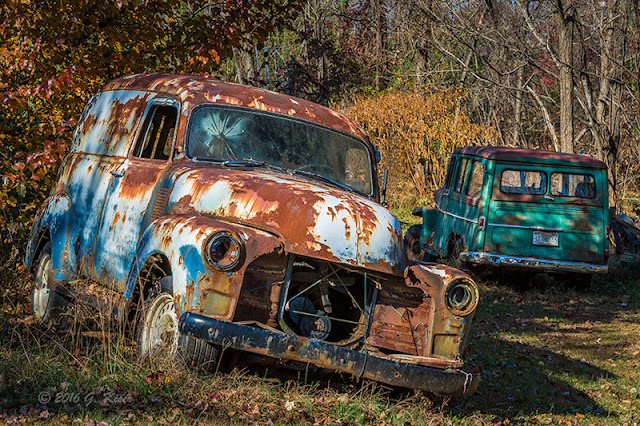 However, as a photographer, I love these opportunities, and am always looking for "Old Iron" sitting on folks' property. 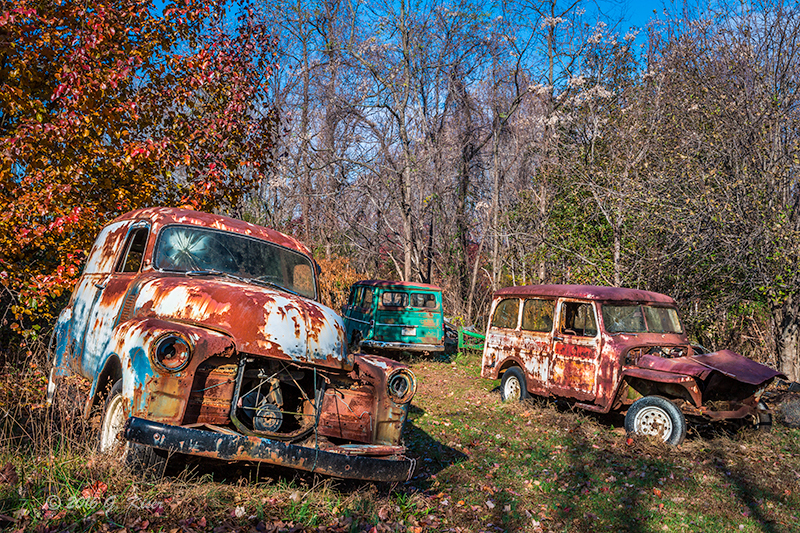 If you have anything like this on your property, shoot me an email (gkiserphotography@gmail.com) or call me (336-681-0220) and I'll do my best to create some art for you! It feels like it's been forever since I've gone out on a Trek! Between work, travel, and the fact that the weather has not cooperated with me over the last month, I just haven't been getting out at all. But wait...the weather has been beautiful. It's been warm and sunny which is very odd for November in NC. Well, those sunny days don't really do a photographer any favors. We typically enjoy when the weather turns bad. Clouds and strange weather patterns are our bread and butter, and my plate has been empty for a while now. The lack of clouds and rain also have brought about another problem....drought. What was working into a nice and colorful Autumn, has turned into something less than colorful over much of the state. Add to that, most of the rivers and streams are drying up. With my motivation being waterfalls here recently, this was a huge problem! Looking at the weather for the weekend, it seemed that I had a good chance of getting some good cloud clover in the mountains, while it was still supposed to be mostly sunny here around the house. The weather was right for waterfalls, but the lack of water was going to cause many problems with finding waterfalls that still had water flow. Add to that the wildfires that are burning up a good portion of the Western portion of the state. I knew of one place that was likely to still have some decent water flow, and it happened to be one of my favorite places to go...Big Creek, in the Great Smoky Mountains. 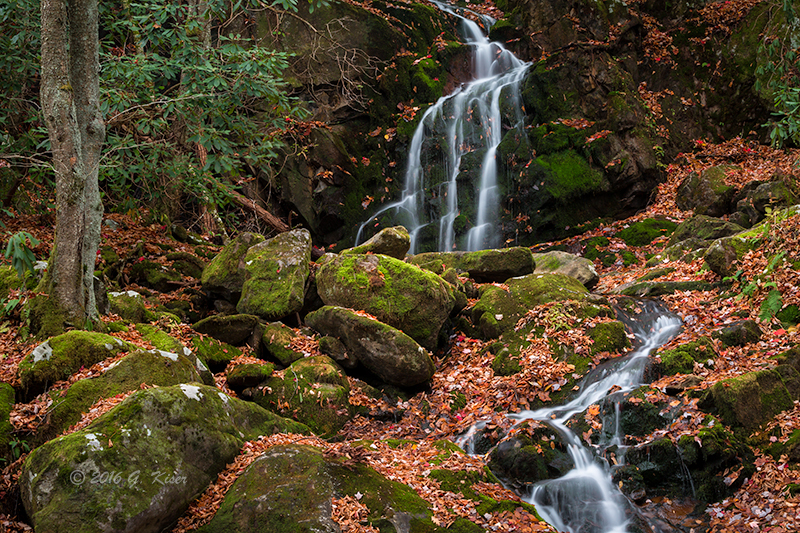 There are two named waterfalls along the trail, and lots of rapids that are pretty deep for the most part. There is even a Duke Energy plant on the river which indicates that it should have water in all but the most severe droughts. As I tend to do, I started my day very early at 4am, and I was on the road by 5. The trip to the trail takes just a tick over three hours from home. This is a huge investment of time considering that I didn't know how much water was there, and whether the wildfires would cause me any problems. Add to that, the sky here at home was completely clear for as far as I could see. I trusted my instinct that this was where I needed to be heading though, and drove West. It wasn't until I was past Hickory that I started to see clouds above. Not until about 30 miles from Big Creek did I see the rain that was forecasted. It was actually a nice soaking rain, but I was sure it was not lasting long enough to do any good for the fires, or for my purposes. When I got to the exit off of the highway, I was quickly greeted with a sight that I wasn't familiar with...Instead of aqua colored rapids, all I saw were lots of large rocks. There was some water running, but it was very low. I was really hoping that this was not indicative of what I was going to find inside of the park. I continued down the road, not seeing a sign at all of the powerful river that usually paralleled the road. I was getting nervous, and was thinking that I just wasted my day, but I was here, so I was going to go hiking at least. Once I started in on the trails, you can see above, there was precious little water in the riverbed. There were bits and pieces of rapids that I could see from the trail, but early on, I was unable to hike down to get to them. it was not until about a mile in that I was really able to scramble safely down to the water. Gone were my big rapids with the awesome aqua colors. 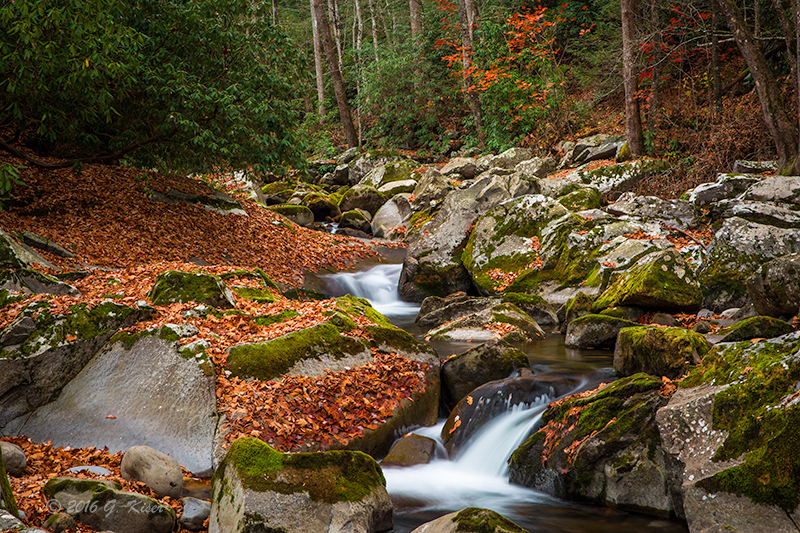 Instead, the water was replaced by a riverbed of large rocks. The landscape was completely changed, and I wasn't sure quite what to do with it. The more I considered my options, the more I realized that I was going to be shooting a good deal of intimate shots, rather than all encompassing landscape shots like I enjoy with this location. Most sections were no more than three feet to six feet in size. I had to get creative with my compositions, and focus on using my 70-200mm lens. I tried to get reflections where I could, and I played with the white balance a bit to achieve some different effects than what I normally get. As you see above, there were some interesting textures in the water, but I wasn't really satisfied with what I was seeing. I was starting to think that I had chosen the wrong location to shoot today. One area that I was working for a bit held a surprise for me, just over my shoulder. As I am in the habit of doing, once I was finished with a particular scene, I start looking around to see if there are other subjects that I could work with. I happened to find this one just downstream, and I didn't even have to change my vantage point which was a very good thing. you see, I was perched atop one of the many rocks in what was left of the stream. By just rotating the camera, I was able to capture this abstract shot. The best part of this one is that it is about the only one that shows the aqua color that I love so much with this water. I was fortunate to have the leaf on the one rock for scale. It adds a little more to the "what am I looking at" quality. I also liked the rich tones in the surfaces to the lower right. This was just about to be the last picture taken today as well. The angle at which I was operating, and the fact that I was right on the edge of one of the rocks caused me to lose my balance ever so slightly. With nowhere to fall that would end well, I grabbed onto my tripod and the long lens on the camera. Fortunately, that gave me just enough balance to keep me from falling off the rock. Water photography is tricky sometimes! I was lucky enough to find some areas where the water flow was significant enough to allow for some more typical landscape shots. I found this scene which showcased a small group of rapids, and they were balanced out by this one rather large rock to the left. In the shadows, you can barely make out the aqua hue in the water. I tell you what, when the conditions are right, this is one of the prettiest places around for water photography. When water is scarce, there is still a certain character that remains here, and I was starting to get in that frame of mind. Part of my photography has always been previsualization. Simply put, I have certain pictures in mind before I even get to the location. I know what types of pictures I will be looking for based on my destination. Today, I was caught off guard by the lack of water, and it took me a while to get in the right frame of mind for Big Creek. Once I got there, and knew what I was looking for, things started working out much better than I was thinking they would. One of the areas I was looking forward to was Midnight Hole, which was a small waterfall about a mile or so it. I found it...what was left of it. I had never even knew that the falls were obscured by rocks before. The flow is usually strong enough to be much more prominent making me think that it wasn't actually obscured. Well, this time, I could barely see it, and was unable to get out in the middle of the stream enough to photograph it. I had to chalk this one up as one that got away. 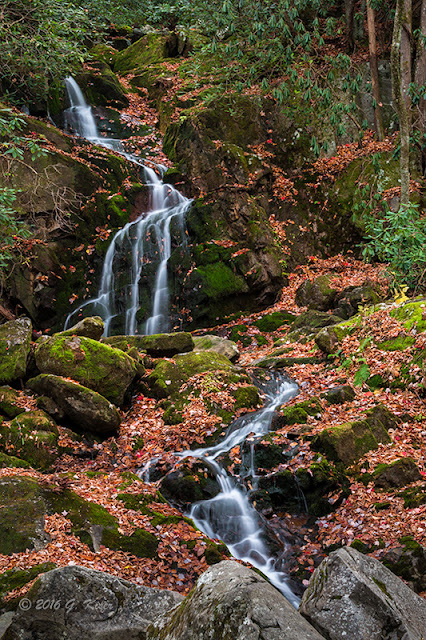 The other waterfall on the trail is the major attraction for the park, and it is called Mouse Creek Falls. I have photographed this once before, but never really liked the result. I wasn't expecting much different this time with the reduced water flow. However, when I got to the second falls, I was pleasantly surprised with what I saw. There was not much water, but what was there, had a lot of personality. In fact, this one looked better than when the water flow was generous. I was unable to get the vantage point that I wanted from the trail, so I started to scramble down to the base. 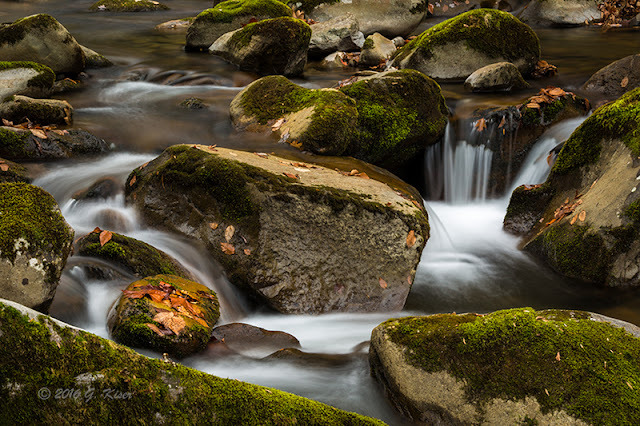 When I got there, I realized that the boulders at the base obscured my view, and made a good photograph impossible. I started to work my way up the embankment, and found that about half way up, I had a great view. In fact, I was even able to put the lower section into the "V" of the rocks. I set the camera up as carefully as I could considering I was on a very steep hill. It was another awkward position, but I made it work. I was able to place each element in the photograph in exactly the right position. Not only was I able to get the entire waterfall, I was also able to zoom in and get a few intimate sections like this one. While I normally prefer my waterfalls to be full, this one seems to work very well with only a trickle cascading over the rocks. The trick here was waiting for the wind to die down so that the branches weren't moving enough to blur in the picture. I believe that this was about 8 seconds worth of exposure. 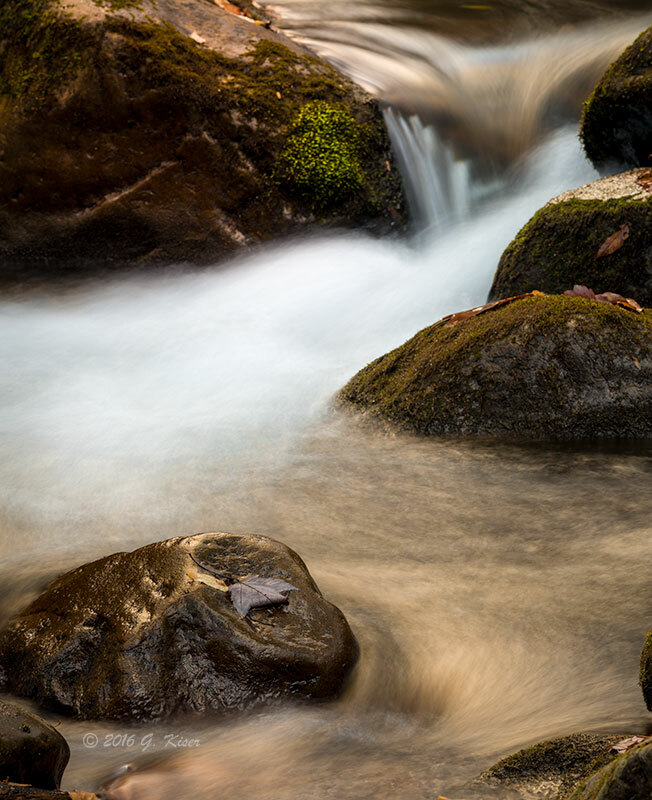 While I was working on intimate views of this waterfall, I had the crazy idea to flip the camera over to horizontal and work a composition that included some of the landscape around the waterfall. 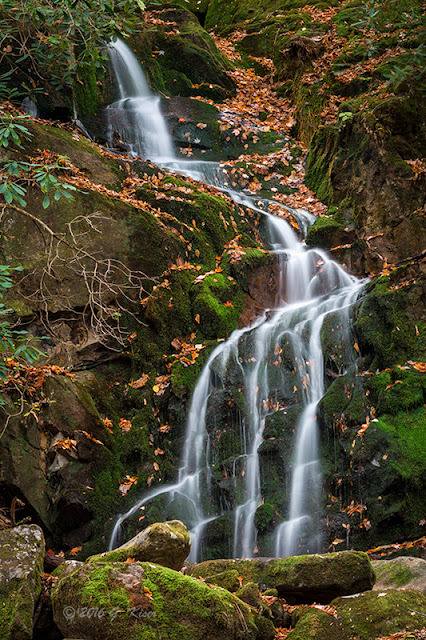 As I mature as a photographer, I've found that waterfalls look really good with some context around them. Not only does it give a sense of scale, it also gives a sense of place for the falls. In a surprise twist, I found that I liked this version much better that the entire falls, or any of the isolations I shot. Again, the biggest challenge was waiting for the wind to die down enough to make the branches stop moving. The trunk to the left frames the shot very well, and it adds the much needed third vertical element to the image for a nice balance. The fallen leaves provide the color balance to the green moss, and the water gives great visual interest. At this point, I knew that I had a keeper from the day, and I could tell that my eye was in tune with my surroundings. That motivated me to continue moving along in search of other scenes. With my recent success with Mouse Creek Falls, I started looking for more large vistas, but they were few and far between. I did find a number of isolations that I was able to frame and photograph. Doing these intimate shots in a very random rock garden is harder than it appears. Creating order and balance becomes the biggest consideration. First, you find a potential subject that has visual interest. Then you look at what is around it, trying to find complementary elements. From there, you position yourself so that you can include only what you intend on having in the frame. One advantage of doing these types of images is that you really get a feeling for the textures of nature. Getting in this close makes it look like you could just reach in and touch the soft moss, feel the spray of the water, and bump up against the rough rocks. Every once in a while, I get a good idea. Today was one of those times. Normally, I Turn around at the carriage bridge, but today, I decided to continue on. I did not have any particular need to get on the road quickly today, and I was enjoying the very Fall day. Not long after passing by the bridge, I came across a fairly nice sized cascade in the middle of the stream. It was not exactly easy to get to though. If memory serves, I took about five minutes of scrambling to make it down the bank to get into position to be able to see this. 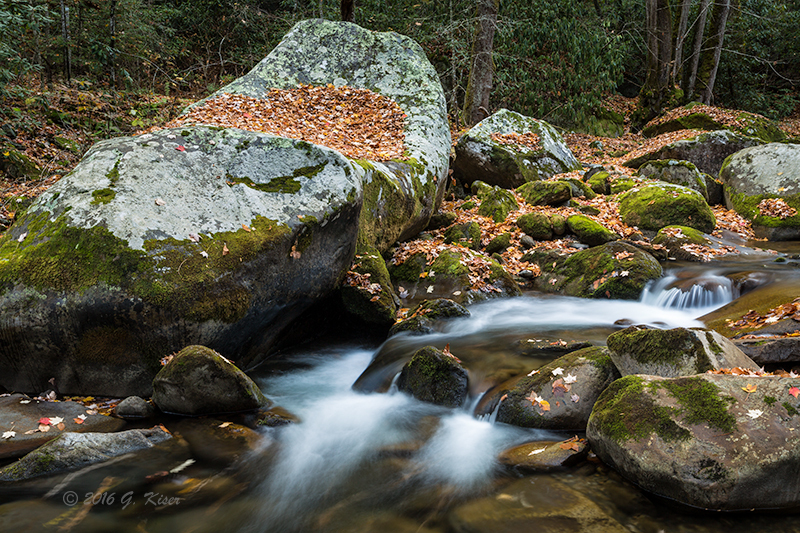 Of course, I had to make my way back onto a rock which got precariously small once I got the tripod set up. I was finally in a great position to use my 24-70mm lens to capture the background and to really show a sense of depth. I would love to say that this took a lot of trial and error to produce, but I shot a total of 10 versions of this scene, and the one that I liked the best was the first trip of the shutter. It had everything that I wanted in the picture. Of course, my favorite aspect of the shot is the cascade in the foreground. This was what drew my attention in the first place. In order to contain the eyes, I used a bit of the rock in the lower right corner. Because of that rock, the eyes are forced back into the frame, and then they are lead back up streak to what appears to be a tunnel in the bare trees. I'm not sure what this setting would look like on a normal day, but I think that the reduced water flow actually made this one possible. With a normal amount of water, I'm pretty sure that the drama would not be here, and there is a good chance I would be unable to get on top of the rock I was shooting from. 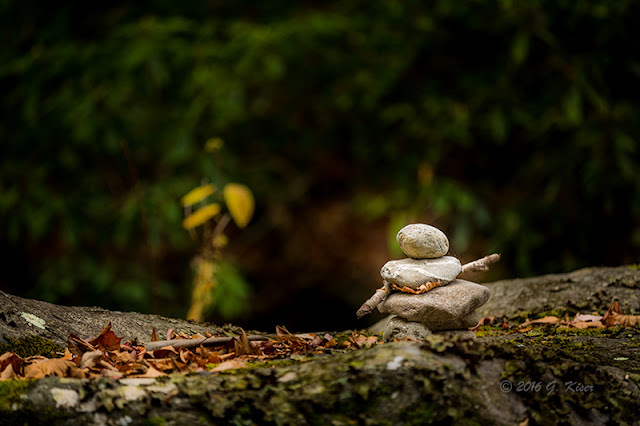 While I was shooting the previous scene, I happened to find some stones stacked on a neighboring rock. While I had seen a few of them out on the trails today, this one caught my eye. It reminded me of a snowman with sticks for arms. 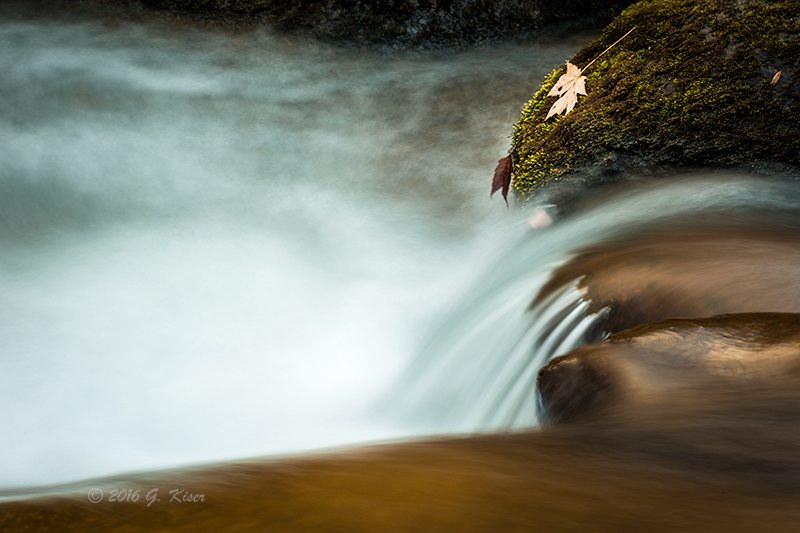 There was a nice balancing element with the yellow leaves to the left, and I thought that it was worth a shot. Knowing that I was going to want to really make the cairn stand out, I shot with the lens wide open at f/2.8 to blur the background. Once I started to process it, I did a good bit of dodging and burning to get it just right. I wasn't sure whether or not I would like this picture when I shot it, but I have to say...it has grown on me. It is definitely something different from what I normally do. 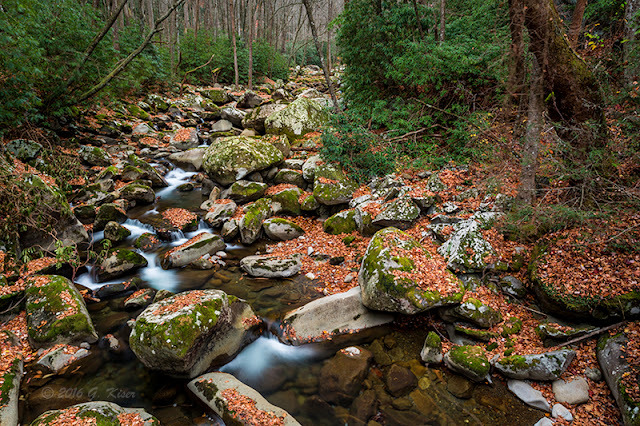 Another one of my favorite images from the day came from the return hike. I had passed by this location a few hours before, but it didn't speak to me. I'm pretty sure that was because the sun was poking out of the clouds when I was in this section, and that ruined the lighting that I was after. on the return trip, however, the lighting was perfect once again. I decided to work my way back out in the riverbed and try to frame something up. Once I got into position, I saw the one element that I really wanted to put in the shot. There was a tree with bright orange leaves still attached in the distance. I worked on positioning myself so that the small cascades would lead the eye right to the tree in the background. I shot this also with a vertical composition, but I felt that I liked the open feel of the horizontal with the complementary elements to the left. When it was all said and done, I had shot 107 frames, and decided on keeping a total of 11 images. This keeps me in my target 10% hit rate. Considering the lack of water, I found a lot more scenes than I though I would. I would have liked having a lot more water, but overall, I'm pretty happy with this Trek.